Historical – A large selection of historical Wisconsin maps. Roads A good source for Wisconsin road maps online. Roads – View the highway map in regions and zoom in for greater detail. Roads and Highways Map Click on the map for a more detailed road and highway map of that part of the state. Roads – Print the highway map in regions and zoom in for greater detail. Rand McNally Wisconsin Travel Map – A laminated, tear-proof folding highway map. 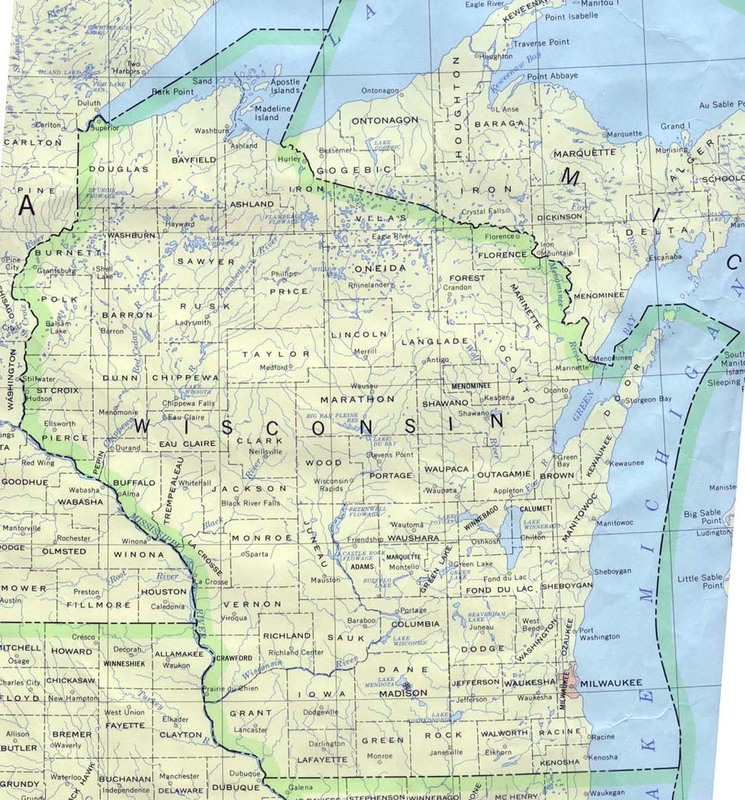 Wisconsin Wall Map – A colorful shaded relief map available in plain paper or laminated. 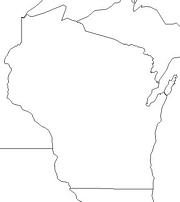 For a large selection of other Wisconsin maps, click here. In 1634, the French explorer Jean Nicolet landed at Green Bay, the first known European to visit Wisconsin. The French ceded the area to Great Britain in 1763, and it became part of the United States in 1783. It became the Wisconsin Territory in 1836 and a state in 1848. Glacial activity resulted in over 8,000 lakes of many sizes in Wisconsin. The state is largely flat to rolling hills, with moderate hills in the southwest. The Wisconsin River, with its extensive dam system, bisects the state from north to south before heading west to join the Mississippi River. Also flowing into the Mississippi are the Black, the Flambeau, and the Chippewa Rivers. In the east, the Fox, the Wolf, the Peshtigo, and the Menominee Rivers drain into Lake Michigan. Much of Wisconsin is forested and forestry is a key industry in the state. Appleton and Green Bay have one of the largest paper products complexes in the nation. Iron mining was a major activity in the past, but has stopped since the late 1960s. Copper is now an important mineral. 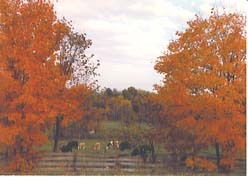 Wisconsin is well-known for its dairy industry, and it has one of the nation’s largest dairy cattle herds. Other farm commodities include soybeans, corn, alfalfa, potatoes, oats, hay, and a large variety of fruits and vegetables. Wisconsin had the nation’s first kindergarden and the nation’s first hydroelectric plant. Sheboygan is the Bratwurst Capital of the World and Wisconsin is also home to the Swiss Cheese capital of the world. The Loon Capital of the World is in Mercer and Eagle River is proclaimed Snowmobile Capital of the World. Door County is unique in the U. S. for having 5 state parks and 250 miles of shoreline.